Retinoblastoma protein (pRB) and p53 pathways play a key role in controlling the cell cycle and apoptosis in response to oncogenic insults and DNA damage. Disruption of these pathways deregulates the control of cell proliferation and represents a common event in the development of most types of human cancer. Recent studies have revealed that several long noncoding RNAs (lncRNAs) are involved in the regulation of pRB and p53 pathways, through transcriptional and translational control of target genes. 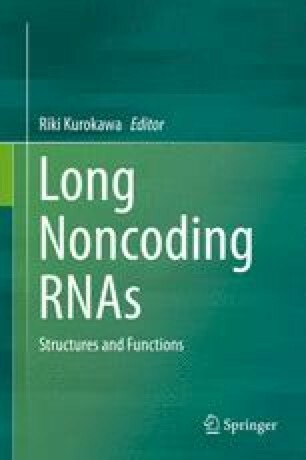 In this chapter, we focus on four lncRNAs: ANRIL, lincRNA-p21, lincRNA-RoR, and PANDA. These lncRNAs are involved in the pRB and p53 pathways. ANRIL associates with and recruits polycomb proteins to repress the transcription of cyclin-dependent kinase (CDK) inhibitor p15 and p16 genes, resulting in the repression of pRB function. lincRNA-p21, lincRNA-RoR, and PANDA are induced by p53 in response to DNA damage and regulate apoptosis. We discuss the involvement of ANRIL, lincRNA-p21, lincRNA-RoR, and PANDA in cellular functions through the pRB and p53 pathways, and the molecular mechanisms by which these lncRNAs regulate the expression of target genes.